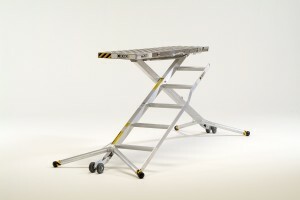 The 5 Step 18″ Industrial Platform has 5 Steps and weighs 62 lbs, but it is certified to hold 2,000 lbs. It has a 63″ x 18″ deck to stand on with a tread pattern that is aggressive, but adds to the strength of the product. 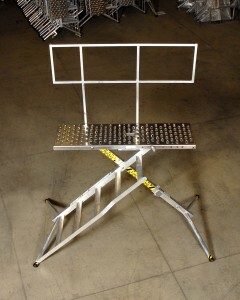 It has 6 height settings and can adjust from the highest setting of 5’10” in 7″ increments to the lowest setting of 28″. When the Platform folds flat it is 120″. This platform has a handle connected to the plank for easy carrying as well as a hand hole in the middle of the plank to carry the platform with a straight arm. This model comes standard with a hinged leg. This allows a user to fold the X-Deck flat and then the leg without the rungs can hinge back on itself for more compact storage. So the width folded flat is 120″, but when you hinge the leg back it is only 7ft. 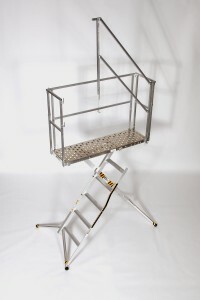 This model comes standard with a full length handrail. Smaller handrails are available on request. Upgrade to a Wrap Around Handrail for added safety.